Review of Warsteiner Premium Verum | Beer Apprentice - Craft Beer News, Reviews, Interviews and Info. Hello guys. I hope all is well. It’s time for another craft beer review. Today, I’m going to be sharing with you my tasting experience of the Warsteiner Premium Verum produced by the Warsteiner Brauerei located in Warstein, Germany. 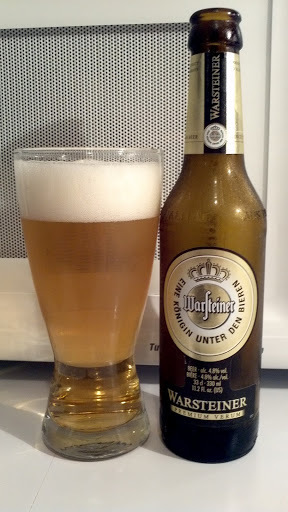 I have had this brew several times before, however it has been a long time since I last tried it, so…..
Here’s the description from the website, warsteiner.com. Enjoy this world-class international premium pilsener. Unique: the slightly tart taste experience. Exceptional: the top quality of the ingredients. Inimitable: the exquisite premium character. Pleasantly light: thanks to especially soft brewing water. This brew comes in an 11.2 oz. bottle and has an ABV of 4.8%. The appearance of this beer was a very clear, gold to light honey color. It had a very bright white cap of good size and average retention with only sub-par lacing left behind. The head was smooth, but it looked to be a bit soapy in texture. The aroma started with a grainy nose followed by some grassy hop notes. A bready/biscuit smell was accounted for along with a subdued citrus fragrance. The aroma seemed to be balanced ok, although I did not find it to be overly complex. Just a solid and decent aroma. The taste began with sturdy punches of grain. A very hardy bread and biscuit malt seemed to define the taste more the further I went along. Only a little bit of grassy bitterness and sweetness counterbalanced the prevalent malt, however that was quite alright as the malt never became displeasing. The flavor seemed very clean, fresh and slightly toasted, yet like the aroma, it was also rather straight forward. The mouthfeel was medium, smooth, crisp, clean and very dry. The liquid did a nice job of washing over the palate and leaving plenty of flavor behind after the swallow. Overall, I think this is a pretty good beer. It’s nothing outstanding, yet it’s nowhere near horrible. It would be an excellent session beer for a lazy afternoon. I also think that it could be a great gateway beer for someone interested in craft beer. It has a decent appearance, an ok nose, decent flavor and a worthwhile mouthfeel. I would never have a problem drinking this if it was offered. In fact I quite enjoyed the straight forward aspect for once. For sure give the Warsteiner Premium Verum a try if you have yet to do so. Thanks for reading everyone. Don’t be afraid to comment if you have a suggestion or critique. Just had this beer yesterday – accurate review! Thanks for reading and commenting. This beer is a solid, decently well made drink. I don't necessarily think that it's anything to write home about, but it's worth a try if you see it. We really enjoyed your review, too bad we didn’t get an A rating. We will be releasing a few more beers in the United States in 2015, so make sure to keep your eye out for them. They are currently a big hit in Germany, so we are excited to bring them to the states.